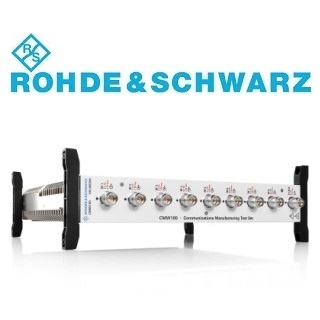 Rohde & Schwarz has released the latest version of the R&S CMW100 communications manufacturing test system, enabling the testing and validation of sub-6 GHz 3GPP 5G new radio (NR) based devices. 3GPP's 5G NR will support frequency ranges up to 52.6 GHz, but initial 5G designs will use frequencies below 6 GHz with a focus on 3.5 GHz. For these sub-6 GHz carrier frequencies, 3GPP currently discusses a maximum bandwidth per component carrier of 100 MHz. Thus, the R&S CMW100 communications manufacturing test set with a measurement bandwidth of 160 MHz is ready for testing initial 5G NR sub-6 GHz wireless devices. Thanks to its high measurement speed, the R&S CMW100 is an ideal solution for high-volume production environments. The flexible testing solution is suitable for all types of wireless devices, supporting LTE, WLAN and Bluetooth besides 5G NR sub-6 GHz. This makes the R&S CMW100 a cost-effective solution for mass production of cellular and non-cellular (wireless connectivity) devices calibrated and verified in so-called non-signaling mode (analyzer/generator). Manufacturers of handsets and devices profit from a variety of measurement functionalities with a single investment in equipment, training and adaptation costs. The latest 160 MHz version of R&S CMW100 is available now from Rohde & Schwarz. Dedicated vector signal analysis and generator software options supporting 5G NR sub-6 GHz will be available in 2018. For more information on the R&S CMW100 test set, click here.